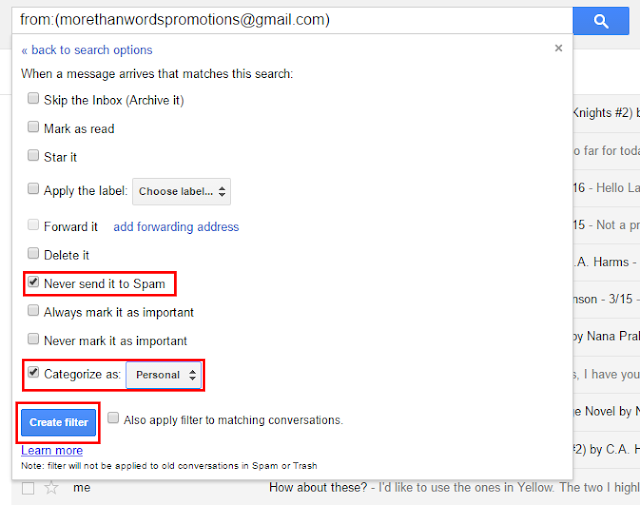 More Than Words Promotions: How To: Create an Email Filter in Gmail! 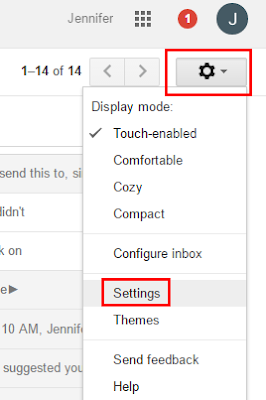 How To: Create an Email Filter in Gmail! Recently I've gotten messages from a large volume of Blogs stating that they are not receiving emails from More Than Words Promotions. I also run Battery Operated Book Blog and often notice we do not receive emails, albeit sporadically, from certain Promotions companies. I believe this to be on the part of Gmail and not anything you have done as the Blog itself. If you are using Yahoo, AOL or any other email client, there is hopefully something similar to this Tutorial that you can follow that will help you as well. Log in to your Gmail Account and look for the "Cog" in the Upper Right corner of your screen under your Account Circle (mine is a "J" in the picture below). Click on the "Cog" icon. From the drop down Menu, choose Settings. 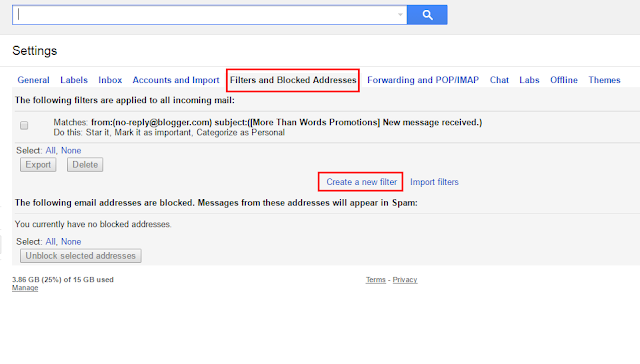 Click on Filters and Blocked Addresses from your Settings screen. Choose Create a new filter. Under the new window find From and add the Email you are wanting to create the Filter for. In this tutorial we are creating a Filter for More Than Words Promotions so I added: morethanwordspromotions@gmail.com in the From field. You are now going to choose where you want your Filter for morethanwordspromotions@gmail.com to go. Optional: You could also choose to Star it or Always mark as important. 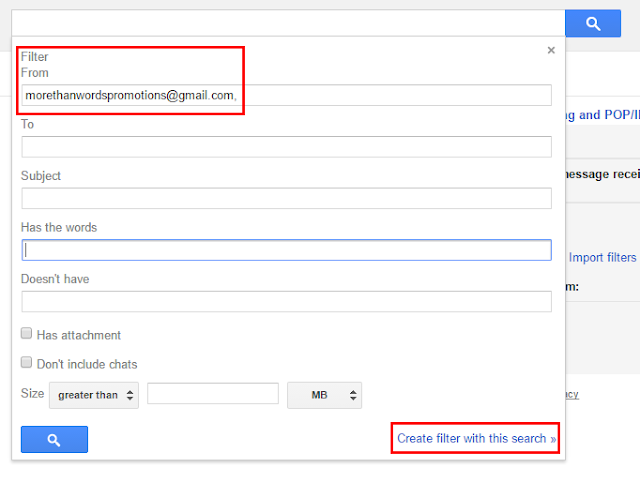 You could even have created yourself a Folder where More Than Words Promotions emails can be filed and choose Apply the label - Then choose the folder where you have filed these emails. Success! Your Filter was created. You should see a screen similar to this one if you have performed the above steps correctly. You see that we now have the Filter that Matches: from:(morethanwordspromotions@gmail.com) and it will Do this: Never send it to Spam and Categorize as Personal. You may now practice this and create Filters for all of the Promotions companies you participate in Hosting events with!